The sage foreground was finally dry enough so I could scan the painting. Small adjustments to the background and some overall "little touch here and there" was all I think the painting needed. Tomorrow is "packing day." Or, I could say, "puzzle day." What is the most efficient use of volume and weight? You have 14 wooden crates of various sizes. Twenty paintings and some prints. You want to ship the fewest number of boxes to limit the weight from the wooden crates, but, if the boxes are too big, you are charged extra for dimensional weight. Oh yeah, and each layer of paintings must be totally flat so the next layer of paintings does not torque in shipping and crack the frames. And you have one afternoon to figure this out. This next stage was all about the chocolate lab. I started with the head and moved through the chest, over to the tail and finished with the legs. One thing which always takes me more time are unnatural colors. I am so accustomed to using the colors of nature that when I need to paint something like the dog collar in vivid reds, it takes more time for me to mix the colors. They just aren't second "nature" to me. I also spent a little time on the background. I wanted it muted, but there were places where it was distracting. I am not done with it yet, but I think it is moving in the right direction. Yes, even a time-oriented, organized artist like me can get distracted. It is hard to get back to the easel when this is what I see out my window. I first heard the turkeys. Seems they found the apples which had fallen from our tree. As they pecked at the apples, sometimes their beak would get caught deep inside and they had to flip up their heads to free themselves. Of course, this meant the apple went flying. (particularly amusing when the apple then hit another turkey.) The other turkey would then start into the apple while the first turkey went to claim the wandering fruit. Before long, there were 7 turkeys and about 5 apples in the air. Well, all the commotion attracted the deer. A young buck, doe, and fawn wandered over and yes, found the apples tasty. OK, now we had turkeys and deer all vying for apples in various stages of elevation. First I started with the background. 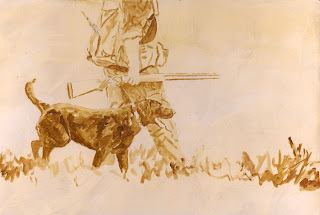 Knowing I wanted to put detail into the hunter and the dog, I decided on a soft background. If I had put a lot of vegetation in the distance, I think it would have distracted from the main subjects. After playing with the background, I moved on to the hunting vest, working my way from top to bottom. The camouflage shirt was tricky. It just didn't have that "RealTree" -like feel until I blended the all the colors with a soft brush and went back in and made sticks and branches. Next, I tackled the pants. It was interesting moving around the wrinkles. When I finished the pants, I noticed that the hunting vest was looking too green and needed a more canvas feel. Adding some yellow ochre helped. Then to the gun. The most difficult part was the barrel. How to get the metal sheen. I used a combination of dark browns, light blues and thick paint (titanium white with a tad of cadmium yellow deep). When it dries and is varnished, I think the barrel will read as a metallic. Finally in this set, I painted the arm, hand, and the pheasant tail feathers sticking out the back of the hunting vest. For many, the colors of Autumn herald the beginning of hunting season. Pheasant season has opened in South Dakota. What better time to begin another "hunting" painting. I am also thinking about the upcoming Waterfowl Festival in Easton, MD., November 13th - 15th. 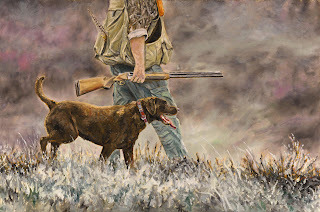 Along with my painting, The Retrieve, (see post Sept 21st), I thought it would be fun to have two companion pieces. Sunset light is dramatic, but I think there is something particularly special about the tonal quality in sunrise light. We spotted this bull moose at the beginning of our trip into Denali National Park. 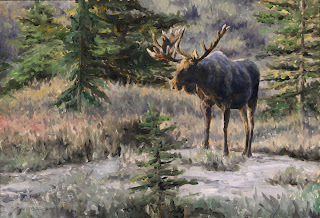 The subtle turning of the tundra, coupled with the light and size of the moose, made for a really fun painting. 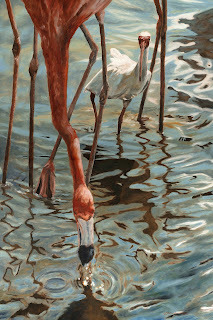 The American Women Artists National Show for 2009 is being held in Easton, MD this year. I am thrilled my painting Among Giants was selected for this prestigious show held at the South Street Art Gallery, 5 South Street. The show runs from Oct 10th - Nov 8th. 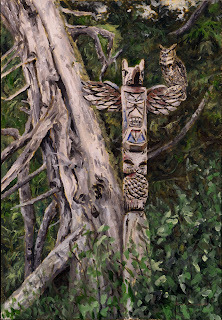 Owl Totem 12.5" X 8.5"
With the same size in mind, I thought I would try a vertical format. In Ketchikan, Alaska, I was quite taken by the numerous totems, especially this one. It has a story which is obscured by time. The great-horned owl seemed to make for a great story-teller. One often thinks of Montana as Big Sky Country. Well, after being both in both Montana and Kenya, I’m not sure which I would put my money on. 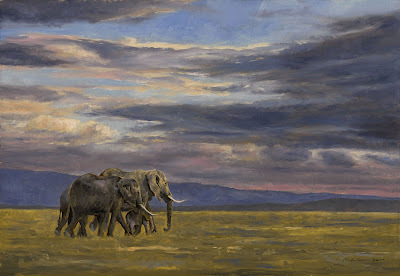 The sunset skies I encountered in Amboseli, in the shadow of Kilimanjaro, were awesome.